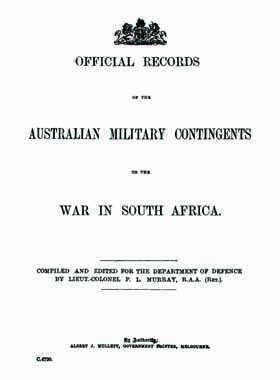 These are official records of the Australian Military Contingents to the War in South Africa (1899 - 1902) (P.Murray 1911). Murray's record is a compilation of official Australian reports in regards to the war in South Africa, and was compiled as a memorial and remembrance of the war. It is written as a reference book rather than a history of the war and as a result contains a huge amount of logically presented facts, figures and statistics about the war, as well as the contingents and men involved.